Ever wanted to know if you can enter transactions in a future period? Well, yes you can. There are times when you may wish to process transactions for a future period. For example, you would like to enter Family receipts or Creditor invoices for next month when you haven’t yet been able to complete the End of Period process. Or maybe you would like to start preparing Family invoices for next term. To do this we use FORWARD BATCHES. It’s been around for a number of years but you may not have noticed it. The process is identical to creating a normal batch – with one small change. When creating a new batch, just change the “Type” from Normal to Forward. 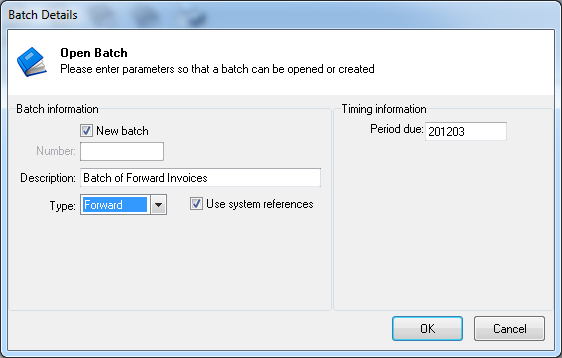 This then allows you to enter the period that you would like to update the batch in. E.g. say the Creditor ledger is in period 201310 and you want to start entering invoices for November prior to doing and End of Period, just enter 201311 in the Period due field. You are then able to enter transactions with a November date in the new batch. You won’t be able to update the batch until the ledger is in period 11 but that’s ok. Also, if you do happen to forget to update the batch in November, an error will occur when attempting to do an End of Period to roll into December reminding you to update the batch.